You can read my own brand of insanity on The Millennium Conjectures. Or you can just pretend you never heard of me. This entry was posted in funny names in baseball and tagged Al Capp, cartoons, comic strips, funny names, quotes. Bookmark the permalink. 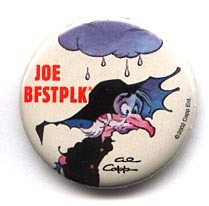 16 Responses to Joe Btfsplk: Oh Vowels, Where Art Thou? 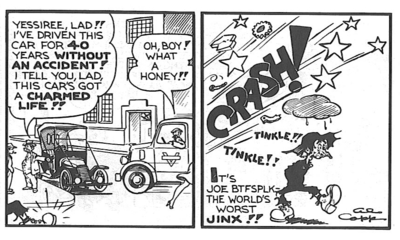 It takes me awhile to figure things out, so I started reading and thought, “I don’t remember this guy in Andy Capp…” Then I reread it and figured out it was L’il Abner. In many of my 40s yearbooks, they have L’il Abner dances, with patrons dressed up as characters. Never this guy, though. Poor little Eeyore dark cloud. It does remind me of my mother-in-law’s maiden name. Hyvl. And all her relatives with that name. Rhymes with Evil. Vry intrstng. Thnk y fr th rply! Lots of great Eastern European athletes suffer from this Vowel Deprivation Syndrome. It’s a plight. Dario Srna. Martin Skrtel. Martin Frk. They all seem to have lost something on the way home from the hospital. How about former first baseman Kent Hrbek? He’s another one! P.S. Is this perhaps Irritable Vowel Syndrome? I think you’ve nailed it right there. If you’re not familiar with the “Onion” story linked to in the article, I do strongly recommend you read it. Pretty freakin’ funny. “The Onion” once did a story about President Clinton air lifting vowels to Bosnia. It was pretty funny. I was proud that prior to the 2006 NCAA Basketball Tournaments, my daughter was placed on the All-Names Team. A reserve forward for the Marist College women’s basketball team, the comment was something like she was consonantally challenged. Her name: Sarah Smrdel. By the way, when my grandfather emigrated from Slovenia in the early 20th century, he also dropped the silent j at the end of our name. Whenever anyone questions the spelling, because Slovenians are known to be, let’s say financially conservative, I always say: Hey, we’re Slovenian, we’re too cheap to buy vowels.